Hey Girlfriends! Kris here! This post is part of a series of our weekly “Fri-yay Weekly Demo” series! Our lucky local customers love our weekly in-store demos. Every week we have a new demo at our demo table! I am going to be sharing these demos on our blog, along with releasing the products for those demos every Friday! Now you don’t have to be local to enjoy our in-store demos! Read about last week’s demo about Sue Daley’s Rotating Cutting Mat here! 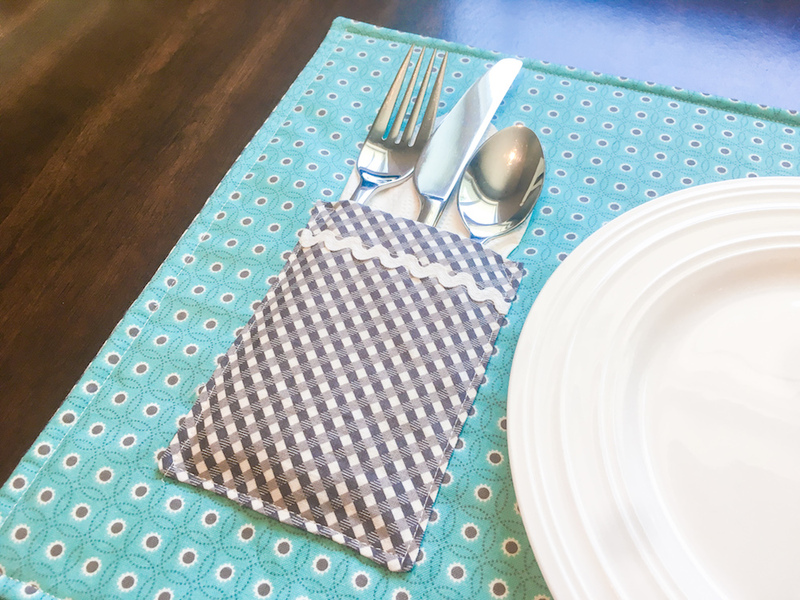 For today’s Friyay Demo, we are learning how to make these darling reversible pocket placemats! We even have kits for this cute little project! 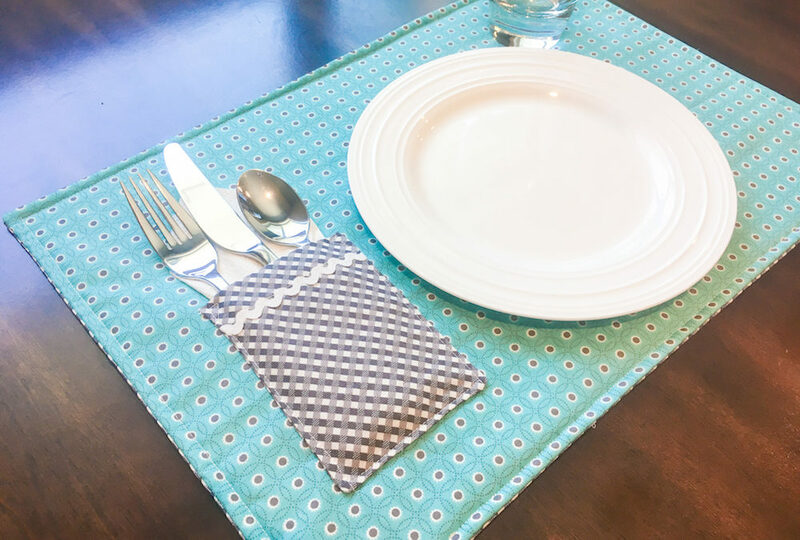 Click here to see our placemat kits! 1. 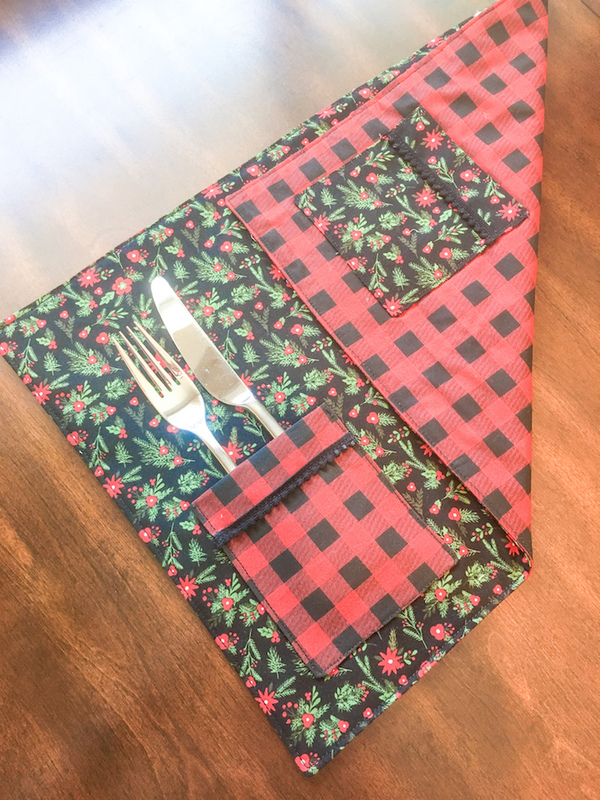 Cut out a 19″ x 13″ rectangle from each fat quarter for the placemat. 2. From the remaining fabric, cut out a 5″ x 10″ strip from each fat quarter to make the pockets. 3. Cut the trim piece in half. **You will have two 19″ x 13″ pieces of fabric, two 5″ x 10″ strips and two pieces of trim 6″ each, plus the batting. Click here to see our placemat kits! 2. Place one finished pocket on a 19″ x 13″ rectangle, in the lower left-hand corner. Measure in about an inch from the left side and up from the bottom 1-1/2″. Pin in place and then top-stitch pocket in place. Repeat step 2 for the other 19″ x 13″ rectangle. 3. To assemble the placemat, layer the three rectangles together, with the batting on the bottom and the two pieces, right side together, on the top. Using the 1/2″ seam allowance, stitch along all four edges. Leaving a 4″ opening on the bottom to allow turning out. Trim the corners and excess fabric. Next, cut a little strip of batting out of the opened seam allowance. Turn right side out and press. Fold the opened seam allowance in, then press to match the edge of the placemat. Lastly, top stitch along all four edges.